Luxury holiday villa Morna is situated on top of a hill in the Morna valley with panoramic views of the green surroundings towards the sea. It is an ideal quiet location, yet close to lots of famous restaurants, amazing small villages and only 15 minutes from the nearest sandy beach. Wonderful holiday villa for 10 with private pool, pool house and air conditioning throughout! 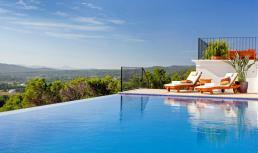 Villa Laura is a splendid new villa located in the heart of Ibiza near San Lorenzo. Wonderful holiday villa for 12 with large pool and internet! Vacation villa Helena is for rent near Santa Eularia within walking distance of the beautiful beach Cala Llenya on the eastern side of Ibiza. 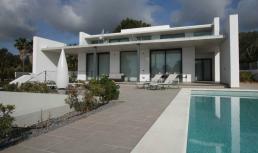 Beautiful new villa with 4 bedrooms, 4 bathrooms, private pool, air conditioning and sea view! Vacation villa Santana is for rent near Santa Eularia within walking distance of the beautiful beach Cala Llenya on the eastern side of Ibiza. Beautiful new villa with 4 bedrooms, 4 bathrooms, private pool, and air conditioning!